Mimi Roy has been recycling since she was a little girl. A pair of pants turned into a nap sac, a jacket into a vest...no piece of clothing was safe from her sewing machine. 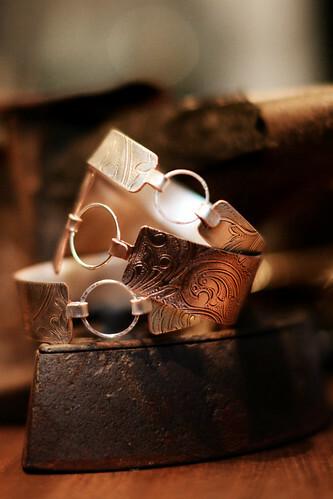 It was only natural that she turned her love of silversmithing into her own creative way of recycling vintage and found metals. 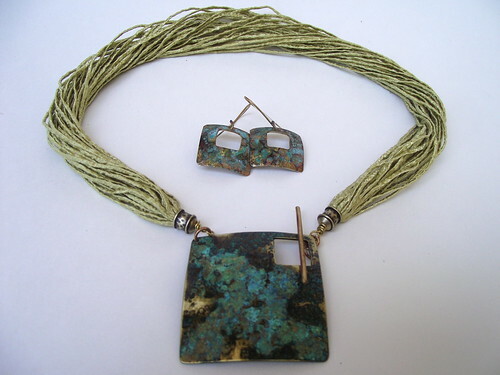 The copper pot that sat on her work bench was transformed into a funky pair of earrings. An idea and a passion was born. That was 4 years ago and now Mimi makes creating jewelry and accessories from vintage family heirlooms into a full time career. 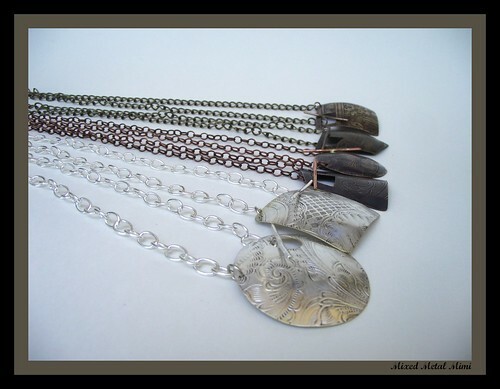 Mimi's jewelry designs are handcrafted from time worn forgotten treasures such as serving trays, platters, and plates to name a few. Each piece that she comes across intrigues her because of the many secrets, history and mystery that are locked in their blemished, tarnished and sometimes dented exteriors. Some of these elegant pieces date back to the early 1900's when times were quieter, simpler before today's quick pace lifestyles and modern conveniences such as televisions, computers and cell phones. Perhaps by wearing a piece of history one will be reminded to slow down and take a breath... even if only for a moment.